Menlo Park, CA. November 16th, 2017 - WeVideo, makers of the cloud-based video editing platform choice of more than 22 million account holders, today announced a new offering, WeVideo Business. WeVideo Business provides businesses of any size with the tools to quickly and easily create, collaborate and share engaging, professional-quality videos for marketing, social media, customer support, training and more. Through Cyber Monday, November 27th, WeVideo is offering a special early adopter discount that gives businesses 40% off the already low regular annual subscription price. 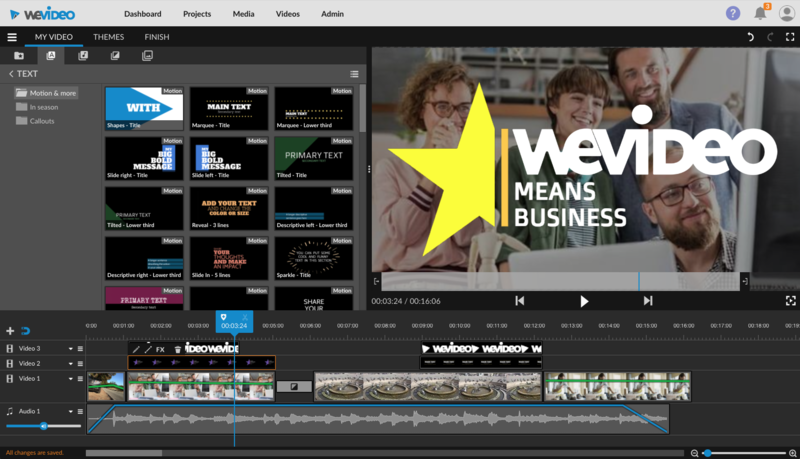 WeVideo Business provides an expansive palette of creative tools including: video editing, motion titles and graphics, green screen, special effects, screencasting, speed control and more. Users can freely mix and match more than 600 audio, video, and graphics media formats with supported video resolutions up to a stunning 4K. Exclusive WeVideo JumpStart&tm; technology lets user start editing immediately without waiting for video to upload to the Cloud. Most important, WeVideo is easy-to-use and cost-effective, enabling anyone to create high-quality business videos from anywhere in just minutes. Business and project templates to help establish a distinctive look and feel for video content. Companies and team members can create and reuse their own templates to dramatically streamline future projects while ensuring that branding and look are always consistent and of the highest quality. WeVideo is entirely browser-based so there is no software to install and it is always up-to-date with the latest features. Since all the heavy computer processing demands of video editing are handled in the Cloud, every user gets the benefit of a world-class editing workstation, anytime, anywhere. WeVideo works on virtually any Apple, Windows or Google Chromebook system. WeVideo projects can be accessed anywhere, at any time, on any device. Finished projects can be streamed from the web, shared online, posted to social media, or saved offline for viewing on TVs, projectors and other devices. WeVideo CEO Krishna Menon said, "Video is by far the most effective form of communication for business, but production at the volume and quality needed is tricky. Businesses have been caught between budget-breaking, time-consuming services or making do with solutions intended for consumers that don't account for business needs. WeVideo is already used by thousands of businesses, from local shops and online storefronts to some of the world's biggest brands. With the launch of WeVideo Business, we are dramatically increasing our commitment to delivering the additional tools and resources businesses need. In the future, we'll continue to add more great features and capabilities to help businesses fully leverage all that video can offer." The WeVideo Business plan includes a team license with three full, connected seats and starts at just $19.99/month when purchased as an annual subscription (and only $11.99/month if ordered by November 27th). Any number of additional seats can be added to the team license at anytime for $9.99/month each. WeVideo also offers flexible monthly plans. Get more details here.